Please meet Dr. Edward Dropcho, my neuro-oncologist at Indiana University Hospital. When he is not treating me, Dr. Dropcho is Chief, Neurology Service at the Richard L. Roudebush Veterans Affairs Medical Center. He also is a professor in department of neurology a the IU School of Medicine. 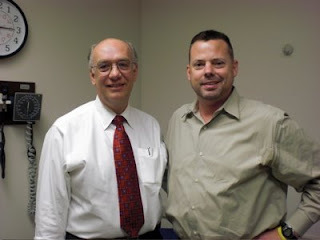 Dr. Dropcho also is co-director of neurology clinical team which includes Scott Shapiro, my neurosurgeon. Where my brain is concerned, Dr. Dropcho is my primary doctor. He analyzes the scans and prescribes the treatments. Drs. Dropcho and Fine have not always agreed on what they see on the scans which has made things interesting at times, but I think that's one of the reasons getting second opinions is so very important. When it comes to reviewing scans with the human eye, it really does become more art than science. I was told very early on that if the exact same tissue sample was placed in front of 100 pathologists, 30 percent would interpret the sample differntly than the other 70. Amazing. Saving the best for last...This young man is Dr. David M. Harsha, director of the Family Medicine Residency Program, and director of Sports Medicine, at St. Vincent's Joshua Max Simon Primary Care Center. Okay, so he's three years older than me, but look at that boyish grin! 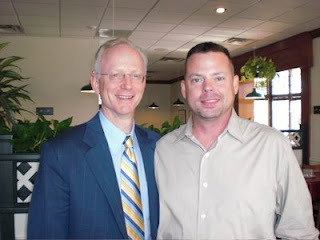 Dave and I met by chance in the very early 1990s when he was finishing his family practice residency at Indiana University. I actually belonged to a gym that I went to on a semi-regular basis. Dave was there with one of his friends and was wearing a pair of Oklahoma State University shorts. A proud alumnus of the "Princeton of the Plains" myself, I went over and introduced myself. Talking about OSU, we learned we were on campus at the same time during his final and my first year, respectively, living only a block away from each other. Since he did not want to become a veterinarian, he attended medical school at the University of Oklahoma and then moved east to Indiana. A year of so after we met, I found myself in need of the services of a physician. I already had a doctor in Indy, but when I called to make an appointment, I was asked if I was wanting to see the doctor because I was "sick" or "well." Sick, of course, why would I see a doctor if I was healthy? Turns out my doctor had recently had a kidney transplant and could not see sick patients due to a risk of infection. Bummer. Uncharacteristically, I not only remembered Dr. Harsha's name, but also where he was practicing on the IU campus. When I first made the call, I was told that Dr. Harsha was not accepting any new patients at that time. I repsponded by saying, "We went to college together." "Hold, please...Dr. Harsha can see you this afternoon." And that was that. David has made a couple of moves around Indianapolis in the intervening years before his current assignment at St. Vincent and I have loyally followed every step of the way. To remind him of his Oklahoma ties (he's really a Michigan native), over the years I have brought him Eskimo Joe's t-shirts from Stillwater's Jumpin' Little Juke Joint. Dave was kind enough to meet with Lee Ann and me over coffee on Tuesday, Sept. 30, to listen to us about the many options we were considering for this second round against the tumor. It was a very reassuring experience to have an objective set of ears listen to what we are dealing with and offer his counsel and advice. For my money, David Harsha represents everything a physician should aspire to be. He is the gold standard by which I have measured all of the other health care providers who have been involved in my case since June 24, 2007. Thanks for always being there for me when I needed you, Dr. Harsha. You, sir, are aces! Glad to know that you're in such good hands. Always important, from my own personal experience, to have good doctors who you both like and trust to take charge of your medical care. I'm sure it makes you and your family feel better to know that you're getting such excellent care. SO honored to have an opportunity to read this Blog. I'm blessed to have met Dr. Harsha last August (OK - July 30?) to interview for a job with him at St V. I share the same birth year of the Blog's author, and appreciate his love for family and humor! I've grown professionally and personally since starting at St. Vincent's department of family medicine a month or so after the interview. I'd only been around a couple weeks when I noticed an appointment on Dr. Harsha's calendar (Yes, this extraordinary group of docs insist on addressing each other by their first names, but I find it hard to do) that caught my attention. I was too new to ask - and after almost 9 months was touched to hear the story of the last visit with Terry. Heartbreaking. Not a dry eye. No names were ever mentioned - it was a colleague who shared the link very today to the story and the blog. I was beyond touched by the sincerity expressed when 'I'm going to meet an extraordinary patient and support his family who is addressing a difficult diagnosis', then connected the dots to 'I'm going for a home visit to a patient and a friend. I wish and hope I too would find a friend in this remarkable family who shared their story and survive a most precious loved one who will forever impact their lives. sending hope and feeling the love Terry created!